Dr. Gary L. Johnson always had a desire to help people. He assuages this desire daily by eliminating people’s pain and giving them beautiful smiles. 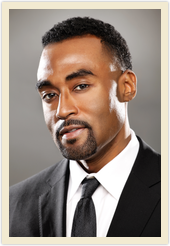 He and his wife, Dr. Angela J. Johnson, own and operate J & J Family Dentistry, located in southwest Atlanta. a Bachelor of Science degree in biology. He then pursued and earned a Doctor of Dental Surgery degree from Meharry Medical College School of Dentistry in Nashville, Tennessee. Johnson is a member of the Elizabeth Baptist Church, where he works with the entrepreneurial ministry. He is a member of the American Dental Association, National Dental Association, Georgia Dental Association, the Northern District Dental Society, the Hinman Dental Society and the North Georgia Dental Society where he has served as Vice President. Dr. Johnson enjoys visiting schools and educating young people about dental health, as well as emphasizing their unlimited possibilities for a successful future. He is the proud father of Evan and Dylan.